Once you’ve installed the requisite packages, go to themes and look up the studio theme. Very nice indeed. If you’re a Windows user and haven’t tried a proper install of Ubuntu (not Live CD), shame on you! Especially now there’s no excuse not to thanks to Wubi. Wubi is a Windows based installer for Ubuntu which magically installs the OS as a folder on your regular Windows partition. Removing it is as simple as deleting a folder in Windows. Nice. During installation Wubi will search for an ISO of the alternate Ubuntu 7.04 install disc, if you have it saved locally alongside the installer it will use the ISO, or else go to a default (read slow) mirror to download. I recommend you torrent the alternate install ISO first for obvious reasons. Compatible with Windows XP currently. No Vista support! Wow! Looks like I missed this somehow… Silverlight, although being touted as “cross-platform” won’t ship with Linux compatible plug-ins. Wise move Microsoft. At least drop the “cross-platform” misnomer! I’ve been using Ubuntu as my main OS since Dapper Drake; having been my first venture into GNU/Linux. Since then Ubuntu has been through two other releases: Edgy Eft and now bringing us up-to-date Feisty Fawn or 7.04 (Ubuntu versioning being 7 signifying the release year and 04 the release month). It’s needless to say i’m thoroughly impressed with Ubuntu… Admittedly i’m a little green as to the other distros’, having only dabbled with SUSE, DSL and PuppyLinux, but Ubuntu has fulfilled my needs so I haven’t really had to look elsewhere. I upgraded to the early release of Feisty a while back now, and it has been rock-solid throughout. Not bad for pre-release software never mind an OS! Anyway the main improvements over the earlier version are a more stable and compatible network manager (wireless networking support primarily), a refocused control panelesque administration section, flashy 3d desktop effects via Compiz, and better binary/restricted or non-free driver support to name a few. The best feature in my eyes however, and the one which has made Ubuntu that bit easier to adopt, has to be the automatic codec installation support. Due to the Ubuntu philosophy of only including free and non-proprietary packages, many codecs were not installed with the vanilla OS installation and required a bit of tweaking and cajoling to get configured… Now they’re installed automatically as and when you need them, making widescale adoption of the OS that bit easier. The final version has been just as stable as the early builds for me, the only notable issue for me being that the 3d effects are a little buggy. I’ve turned those supplied by the OS off and installed Beryl (a fork of Compiz, more stable IME) and all my previous 3d desktop niceness is stable again. Windows development (.NET, IIS, SQL), when necessary is facilitated by VMWare Player and a Windows VM with my stock VS environments. Mono, Rails, MySql and the little PHP i’ve been getting into recently has obviously been native via Linux, Apache and using several IDE’s including Eclipse and RadRails. The usual day-to-day stuff such as browsing, email, media playing etc has been snag-free as usual with Firefox and Opera for browsing, Amarok for audio and iPod management and finally VLC, MPlayer and Xine for video. 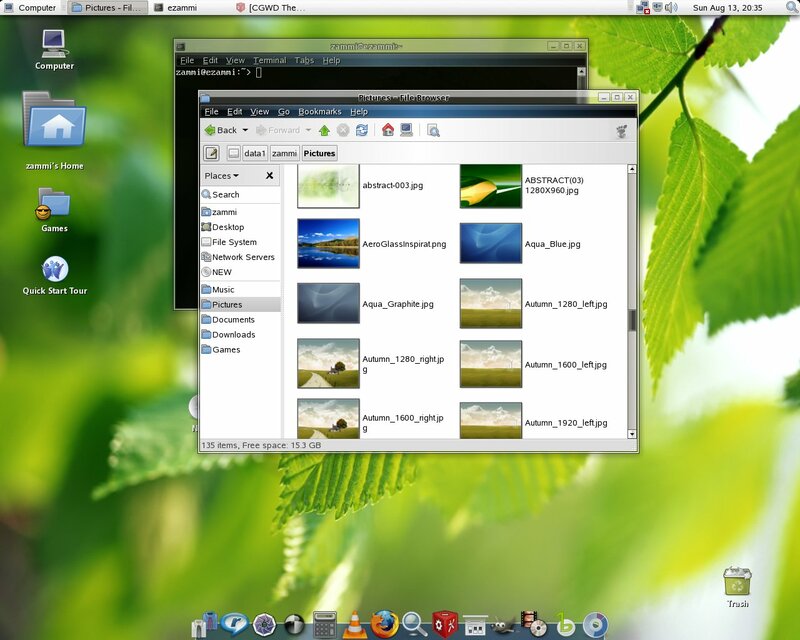 As Miguel states… It just doesn’t feel right using a desktop without the effects provided by XGL/Compiz. If the experience provided by the desktop feels pleasing or perhaps even inviting then surely the experience can be deemed more productive? Well it certainly feels that way to me, especially when coming back to Windows — which incidentally I only use at work for .NET development now. From the Gnome-Look website. The dock at the bottom is the superb Akamaru dock. Give them a go. I took the plunge and installed XGL/Compiz on my Ubuntu Dapper partition after messing around with it for a while via the Koroora XGL Live CD. Following this guide was simple enough (even for me) and within a few minutes everything was setup and running perfectly. The one thing that i’m so impressed by is how this can run on (comparatively) lame hardware, especially compared to the requirements of Vista. You have Linux installed and running. The GUI is working fine, but you are getting tired of changing your desktop themes. You keep seeing this “terminal” thing. Don’t worry, we’ll show you what to do. More Ubuntu linkage, this time in the form of EasyUbuntu.